A Celtic name meaning 'White Wave,' Genevieve conjures an image of delicate femininity and a touch of lace. You'll find both in this luxurious wrap sweater! 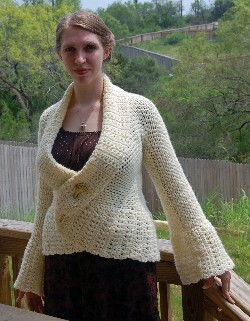 Styled like a vintage bedjacket, it's cozy with a liberal dash of glamour. The pattern is written out in a single size, with guidelines to help adjust the sweater to custom sizes.